This is a 4.060" x 3.780" combination with a few leftover parts laying around the shop. It features forged Racetec pistons with an 11:1 compression ratio, Molnar rods, and a set of 428CJ heads that have been mildly ported and stuffed with some leftover 5/16" stem and 7mm stem valves, 2.08" & 1.63". 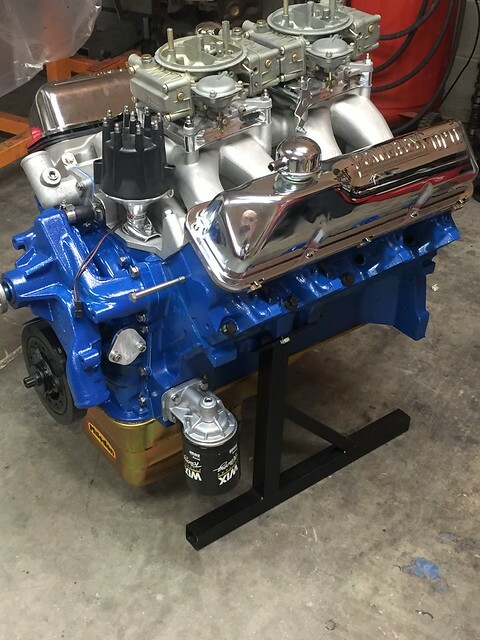 I had planned to use a new Blue Thunder MR 2x4 intake, but the ship date kept getting pushed further and further back, so it got a new BBM Tunnel Wedge that I had on the shelf. Carbs are a pair of Holley 600's. The clincher of this engine is that it's a hydraulic roller engine. In years past we have all dealt with rpm limits of around 6000-6200 with FE hydraulic rollers, due to lifter type, valve weight, rocker arm design, etc. Over the years, we have tried different things to open that up, since a lot of my customers just don't want to be stuck with solid roller and solid flat tappet engines. A hydraulic roller camshaft is as zero-maintenance as it gets and to have one that will pull some rpms is an added bonus. This engine cleanly went to 7500 rpm and probably would have went a little higher if the cylinder head had performed a little better. This is the result of lots of dyno testing over the years, as well as the introduction of some new parts that lend themselves to high rpm operation. This is a roller-tipped, bronze fulcrum, non-adjustable rocker arm for the FE. These are made for me by Harland Sharp. The elimination of the adjuster off the rear of the rocker arm greatly reduces the inertia of the rocker and extends the rpm range, just as a titanium retainer, small valve spring, etc. would do. 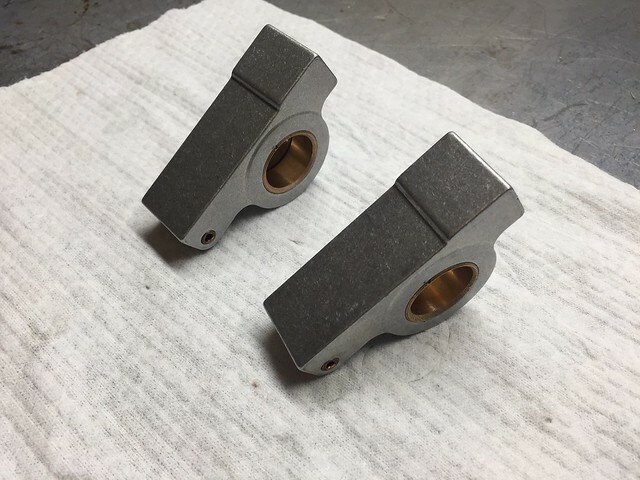 The result is a rocker arm that will take up to 700 lbs of valve spring pressure but has a roller tip that is small enough to work on something like a 5/16" stem valve. Combining this rocker arm with a camshaft that has the right lobe shapes (not too lazy, not too aggressive) and the correct valve springs will result in extreme hydraulic roller rpm limits. 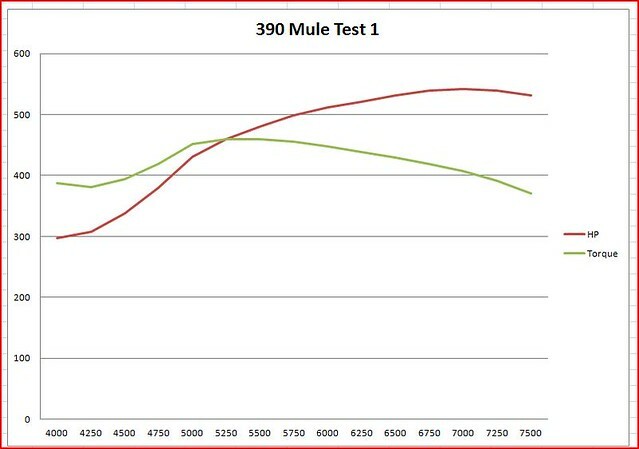 The 390 is a dyno mule and I have ordered a few more camshafts to test. However, to my knowledge, this is the only 7500 rpm hydraulic roller FE in existence and getting those results was a breath of fresh air to me. I have often thought about the forces required in a valve train at high rpm. If you added a set of springs in the lifter gallery that pushed down on the push rod, you could design that spring to be able to hold the lifter on the cam shaft at say 8000 rpm, higher if you want more rpm. This results in the valve spring only having to do work on the valve, keeper, and rocker arm. I would think this would allow for quite a few more revs. The FE design with the push rod going through the intake would take some options away on how to do this, or at least make it a bit more challenging. Often when you have a good idea, someone else has already done it. I never saw such an engine, but I have not seen every engine. Anyway that is my free tip, if you want to shoot for some more rpm. Very cool. What is the motor going into? What you describe was used for decades on solid lifter engines. It uses springs to keep the lifters on the cam. That's not necessary for a hydraulic cam, unless you have lash in the system or you can't keep the lifters pumped up. It's a dyno mule for right now. Depends on the engine size, but we were at 65-67 on this engine. One of the challenges as you pursue higher engine speeds is obviously valve train control. The rockers and smaller diameter valve stems all contribute to the increased engine speed but eventually the need for higher spring rate / higher seat pressure valve springs becomes inescapable. As we pushed the useful rpm range for the late model Hemi's higher and higher we needed increasingly robust valve springs and as was discovered with Spintron time, more rigid valvetrain components. Eventually springs with 450# of seat pressure (or more) and spring rates of 1000#/inch (or more) became available allowing us to substantially raise the engine's operating range. Predictably the next weak links began to appear and become the new front edge of the increased rpm range battle area. For the late model Hemi's those weak points became pushrod strength, integrity of rocker stand hardware geometry and not surprisingly pushrod end cup life. At a 450# seat pressure and a 1.6 rocker ratio an intake spring puts 640# of pressure on the pushrod cup just to lift the spring off the seat! At max lift the spring has 1300+# of open pressure that translates to just over 2000# of open pressure on the push rods, their ends and the rocker stands. Stunning numbers by any standard. Without additives like Prolong and regular oiling of the pushrod ends before firing you quickly kill high dollar pushrods and rockers. The FE rocker design is a lighter and a much simplified design compared to a late model Hemi however, it is still one of the gatekeepers to increased useful engine operating range as Brent has already so clearly demonstrated. The pregnant question quickly becomes is the build a street engine or a competition engine. Although most of us are in street engine land, the challenge in building ultra high rpm engines can be entertaining even intoxicating. However, the question about what you do with the new found power you have in those upper rpm ranges, in an already overpowered steet vehicle, begs the question, why did you do this? Extending the useful rpm range on the FE (for our type of applications) to 7500 or even 8500 (price and parts permitting) is probably useful if not entertaining. Much beyond that point however, the effort is going to take the kind of redesign and ongoing maintenance the Hemi guys went through / go through to raise their useful operating rpm range — maybe not the proverbial screaming hot set up for the street. BTW very impressive job Brent — especially with such street friendly pieces! High rpm FE's have never been a problem. High rpm hydraulic roller FE's have been the bottleneck. Lots of my customers want a little more rpms without having to run a flat tappet cam or the risk of a solid roller. Now we have options. I took it to 7500 simply because I wanted to prove my rocker arm design. It went there very easily with only 200 lbs seat pressure and 500 lbs open. We turn 8500-9000 rpms with <400 lbs seat pressure and 1200 lbs open pressure on my BBF pulling truck engines.....with almost 2.5" valves. The right cam lobe makes all the difference. That's very impressive. Lessons learned for other builds, no doubt. Will you be looking into a version of the rocker arms for standard stroke 289 and 302 engines too? There's no need for them on a SBF. The adjuster (polylock) is on the fulcrum for a SBF rocker. This is a "neutral" area where weight on the front or rear of the rocker is not affected. On a shaft mounted rocker, such as on an FE, the adjuster is hanging off the rear of the rocker arm, which puts weight in a spot that's not optimal. Just to be clear, my rockers will work on any FE, regardless of the stroke or displacement. I haven't looked at SBF developments in detail for some time, so are you saying that 7500 rpm is easily available with hydraulic rollers? Yes. That was the driving motive behind all of this. The LS crowd can hit those rpms easily, as well as the Gen 3 Hemis, SBC's, BBC's, SBF's, etc. Thanks for the info about the high RPM FE. With no adjuster on the lifters, how does one set or specify the OAL of the lifter rods? The higher RPMs brings to mind one thing... what limitation does that reveal? In other words, what part of the engine design modification is next? Head design for instance? In general, I pretty much never get above 5K rpms in my use of the Cobra. Would this design coupled with titanium as the material even get higher RPMs? I guess a #66 would be a good compromise then for my 459 FE - thanks. 7500 rpm is amazing when you consider all the hype about the modular Voodoo motor in my 17 GT350 Shelby and it's red-line of 8250. Developing a 60-year old architecture motor with 80 more cubes pulling down 7500 rpm with pushrods/single hydraulic cam is really impressive to me. You have to measure for pushrods. It’s the same method as when you use factory non adjustable rockers. The rockers themselves will not make an engine pull higher unless the engine is already cammed for it and the valvetrain simply won’t let it get there. Obviously not every FE needs to be a 7500 rpm engine but I did that to prove that FEs can get up there and to prove that my rockers are stout enough to support it. The rockers would make a nice choice for any FE. Not having an adjuster makes it lighter and eliminates another part that can fail.